You can use Voicemail to easily access and select which messages you want to view/read. 1. 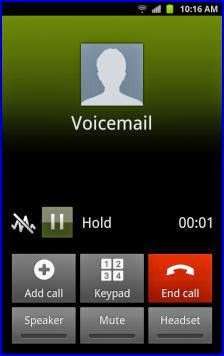 Tap on Apps and then select Voicemail. 2. You will then be prompted with the list of available voicemail messages. To review a message, simply touch it. At the bottom of the review screen, you will see icons for maintenance, storage, messaging and other options. Just touch the Help icon if you need to know of certain options. 1. Listen to a certain voicemail message you preferred to hear. 2. Swipe your finger to the left of right. Doing so will prompt you with the next or previous voicemail message, and it will start to play automatically. 1. Tap on the Apps menu/icon from any Home screen. 2. Touch to select Voicemail. 3. Open a message you want to remove from the list. 4. Touch Delete to erase the message. 1. Touch Inbox to get started. 2. Touch to select Trash. 3. Touch and hold the message you want to restore to the inbox. 4. Touch the restore icon to initiate and confirm restoration of the message. If you encounter any trouble using the Visual Voicemail tool on your Samsung Galaxy S5, please don’t hesitate to share it with us through the comments section and we’ll be glad to find any available solution.